I love antiques. As a matter of fact almost everything in my house is of the antiquated kind. Everything from the beds we sleep on, the flat wear we eat with, to the old door that is hanging on my wall…..old stuff is everywhere. Even my yard is filled with all things old. Rusty buckets to house flowers. Old chairs, painted in bright colors are strategically placed throughout the yard encouraging you to sit and enjoy Gods handiwork. 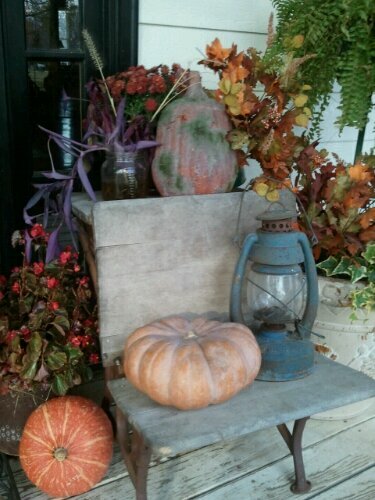 There is an antique bicycle leaning up against a tree and an old school desk sitting on my front porch by the front door adorned with seasonal decorations. There are many reasons why I decided to decorate my house with tired, worn out, leftover treasures. First of all I live with the worlds tightest man, remember? This is a very cheap way to decorate. 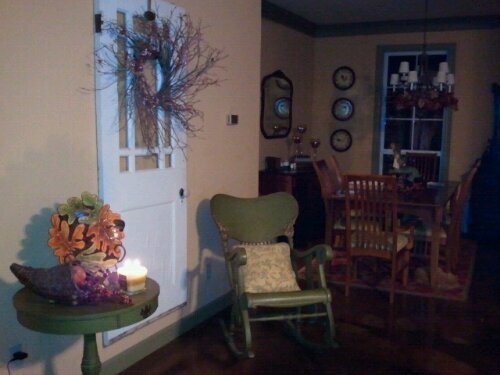 For example, I took a beautiful old door that was in Granny’s house and hung it on my livingroom wall. Beautiful and free! Another reason is because all these pieces of history have a story to tell and I don’t want their story to fade. They were once prized possessions, very important and useful, but in time were discarded for a newer more modern version. At our house, we eat with old silverware that was once black and tarnished. It is now polished, shiny and used on a daily basis. 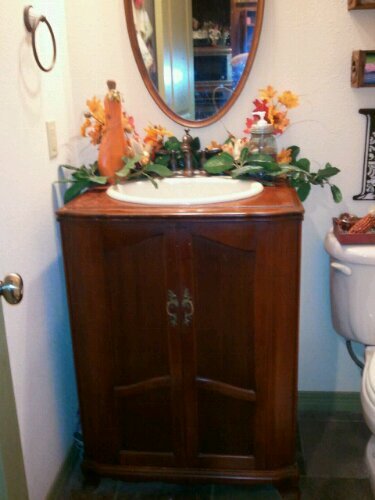 My bathroom cabinet use to be an old T.V. cabinet. 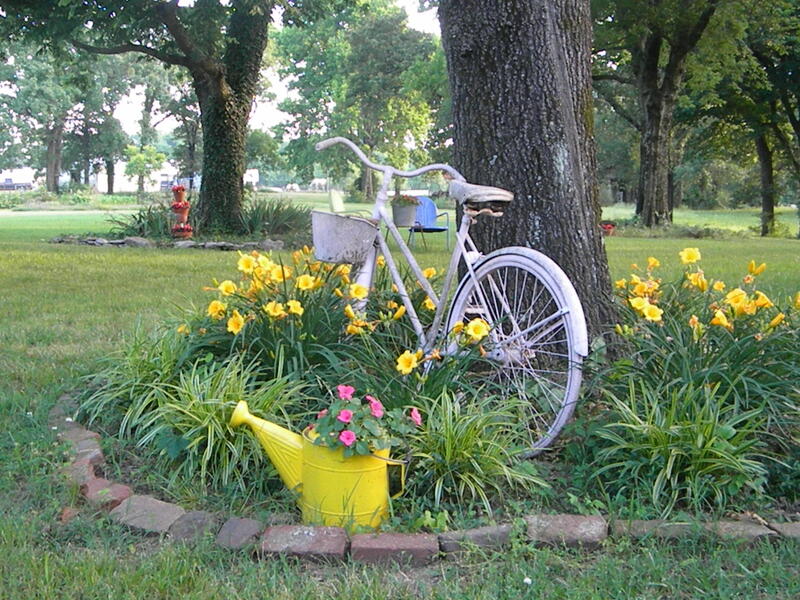 I pulled it out of our barn and repurposed it…..it has life again….. it’s useful again. My laundry basket was once used at a laundry mat in the 1950’s. It was eventually tossed to the side for a much lighter and cheaper plastic version. Not anymore! Now it is used everyday with pride (one of my favorite pieces!) In our dining room sits an old dresser that someone used, years ago, to store their cloths. Now it proudly holds my china. It has been repurposed. It has a new purpose. It has life again. God does the same thing with us. There may be times in our life when we feel used up, left behind or not needed. This is when God shines. He really shows off! He picks us up, dusts us off and gives us a new purpose. Just like we repurpose things….God repurposes people! Don’t ever believe the lie, that you are not needed or that you have nothing to offer. Just stand tall and tell God that you are ready to be repurposed. He will give you a spit shine and put you to work. And just like the T.V. cabinet that is now my bathroom sink, you will be doing something you never imagined! This was awesome.. you never know what God puts in your heart to share with us and makes us feel loved or treasured! Thanks Tonya.. you are loved! You are cherished! Another great “story.” I would love to view the world the way you do and to be able to write about it would be a bonus. Wish I could see that home of yours. I know I would love it. You know you get your decorating talent from your mom. I always used to envy her for that. Needed that today Tonya! Thank you so much! Great post as always Tonya!! Just a beautiful blog!! Thanks for lifting my day! I love reading your short stories, I’m glad Cassady made it to 14, it sounds like my household back in the 50s.